Another Solo and Ensemble Contest season has come and gone. All of my middle school and high school flute students participated this year. I feel that competitions and contests are valuable experiences for polishing a repertoire piece and getting feedback from another teacher or judge. Contests and competitions are unlike recitals because of the additional pressure. 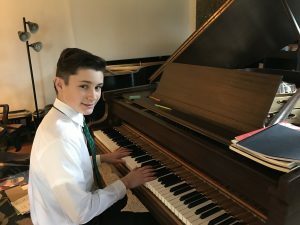 Unlike recitals, which are played for a receptive audience of friends and family, contests and competitions are closer to real life experiences in music. Judges will hold competitors to a high standard. Choose music at least two months before the competition. Ideally, you will want 3 to 4 months to adequately prepare your piece. Make sure that if you are in high school you have checked the required music list. The list can change from year to year. Don’t assume (like I did a couple years ago) that because a piece has been on the list for decades that it will still be on the list this year. Middle school students in Ohio do not have to pick from the published list, but they do have to choose something appropriate for the competition. This means repertoire pieces, not Disney music, pop, jazz, or Broadway. If your music has piano accompaniment, you will need a pianist. Don’t wait until the last week to find someone to play for you. Secure your accompanist 2 to 3 weeks before the competitions or contests and schedule a rehearsal or two. Your pianist is doing an important job for you, so don’t forget to pay your piano collaborator well! Band directors are notorious about waiting until the last minute to submit the application for solo and ensemble competitions. Stay on top of the deadlines or at least be ready to commit to a piece on short notice. High school solo and ensemble contest is usually late January or early February. The middle school contest is often in March or April. Competitions can be any time of the year but many of them are in the spring. The Central Ohio Flute Association (COFA) competition is in April but the required pieces are published in September. You will need a second original, not copied, score of your music. This music must have all the measures numbered in pencil. Judges have been known to disqualify performers if the music is not provided or if it is a photocopy. Consider how you will dress for the performance. It is always best to err on the side of too dressy. Consider how you might dress for a job interview. Look professional. Flute players with long hair should wear their hair back so it does not get in the face while playing. I always advise female students to wear skirts that are at least knee-length. You will want to practice in your dress shoes because tight shoes or high heels can be distracting if you are not used to playing in them. It is fine to wear some modest jewelry and a little bit of make-up if that is something you normally do. Boys do not have to wear a jacket (though it would not be out of place.) At a minimum, boys should wear a button-up shirt that is tucked into dress pants with a belt. In recent years, some schools have encourage their students to wear the band polo shirt. This is fine if you are playing in an ensemble, but soloists should present a more professional look. Know which scales may be asked. Then practice a few extra sharps and flats. It’s not uncommon for a judge to ask for a scale that is not on the list for that player’s level. One octave is the minimum; two is better. Play at a speed that is slightly under the tempo that you can confidently get all the notes. Always use a beautiful tone with lots of air. Practice like you will perform. Visualize the space and imagine people watching you. See if you can create some nervousness. Ask a friend to try to distract you while you play. Flute and piccolo soloists will perform standing. Have all of your clothes ready and laid out the night before. Having to run to the store for hosiery or iron a shirt first thing in the morning is not a good way to start your day. Eat a good breakfast. Flutists should be mindful that dairy products can produce mucus. Spicy foods can make the lips swell and too much salt can dry out the lips. A bowl of oatmeal and a banana is ideal. In fact, there is some interesting research that suggests that bananas can be calm the nerves and enhance performance. Drink plenty of water and take a water bottle with you. Know where you are going, start out early; leave plenty of time for parking, traffic, and the unexpected. It’s better to be early than to have to rush the warm-up or miss your assigned time. Warm up thoughtfully. Play long tones and tune with a tuner. Do NOT play the hardest, fastest part of your music. Stick with the parts you know you can nail, if you open the score at all. My high school flute teacher had a superstition that opening the contest music on the day of the performance was bad luck. Remember that you can’t prepare for everything. Something strange, funny, or weird probably will happen. Your accompanist might get lost. You might realize you only brought one shoe. Perhaps your instrument breaks just as you enter the judge’s room. (All of these things have happened to my students!) Be flexible, have a sense of humor, and roll with it. You won’t be the only person experiencing drama. When you enter the room, smile at the judge and say hello. He or she is probably volunteering or working for low pay and your kindess will make a good first impression. Ask parents and friends to turn off their phones. Make sure yours is off too! If observers are allowed in the room, they must remain completely silent. No photos or recordings of any kind are allowed. Whatever happens during the performance, smile at the end. Acknowledge your accompanist. Thank your judge. If the audience claps, it is appropriate to bow. Take the comment sheet to your next lesson. Remember that judges, teachers, and parents are trying to help you get better. If it wasn’t the outcome you wanted, take this as an opportunity to make new goals and learn from the experience. As a mom, when it’s my kids performing, I like to take them for a little treat after everything is over. Maybe it’s ice cream or sushi or a new t-shirt. I take off my “teacher hat” and put on my “mom hat.” I tell them that I am proud of them and the hard work they put into their music. It’s a nice relief to take the rest of the day off from practicing. What’s the most interesting / unusual / unexpected thing that has happened to you at solo and ensemble contest or at a competition?